After all the weeks of work during the move I made a compilation video yesterday showing scenes through the day: feeding the donkeys, doing my laundry, feeding the donkeys, having a barbecue lunch, feeding the donkeys, tending the trees and plants; and of course, feeding the donkeys. If you are new to the blog, welcome! In June and July I moved my four donkeys from the rented house and field near Finestrat where we have lived for six years, to a beautiful spot near Orxeta: a ten hectare wooded hillside with terraces for the donkeys and lovely views of the Castellets ridge. The hardest work is now done and there is time to enjoy the property during the long summer break. On this blog recently there has been some mention of the only remaining grape vine, down in the valley in the far corner of the property. You can see me watering it in the video, and it is now flourishing. The name “El Parral” means the vineyard and once the terraces were full of vines, but the property remained empty for years and the trees and vines have not been watered. Consequently, now that the move is complete, the major challenge ahead is to save the fruit trees and the vine. There are olive trees, lemon trees with orange grafts, carob bean trees, a pomegranate tree (only just surviving) and two precariously placed fig trees on the dry rocky slope down to the valley. There is no Rubí Tuesday blog this week as Rubí has been staring too long at the moon and has slight moonstroke. Gareth, you have found your idyll. God has been very good to you. By the way, I like the Mr Hulot at the barbecue. I LOVE this video! You have achieved huge amounts in such a short time and the donks look relaxed and quite settled. Will it be colder in the winter as you are nearer the mountains than at your previous home? I just caught your comment in time: once I return home I have no internet or phone signal at present. (Thanks to Orange, who still seem to think I have to remain with them on contract, even though I no longer have a service…) The neighbours who live higher up in the valley tell me it gets much colder in winter. It is a valley between the Sierra Aitana – the highest mountains in Alicante province – and the Castellets ridge which is also a quite high rocky outcrop, so the dense cold winter air and sometimes high winds in winter will mean significantly lower temperatures. Donks will need their winter coats now! They didn’t really need them before, when we lived on the lower land near Finestrat near to the Costa Blanca litoral. Personally, I look forward to some cold winter weather! It will be good to experience the change of seasons instead of constant summer… The stable will need to be finished before the end of August when I return to work. At present it only has the posts and the roof up. I must get the walls finished as a priority during the holidays. Donkeys should not get wet in cold weather as they can catch a chill: their coats are not waterproof like horses’ coats, so they are more vulnerable to cold damp weather. P.S. I’m glad you enjoyed the video. A Spanish teacher colleague just told me the music is really boring. (Gracias, Elena…) The music is called “La Vida es Bella”. I’m hoping YouTube don’t take the video down for copyright reasons. It’s a nuisance that they make such a fuss about music rights sometimes, especially when it’s a non-commercial video. Will their winter coats be thick enough or will they need a light outdoor rug? Don’t know if they make New Zealand rugs for donks! Are you familiar with these? Amazing invention providing winter weather protection for horses – bit like an equine version of a Barbour coat. Lovely video! You’ve done such an amazing job, and in all that heat and just a short time too! It’s nice to see how happy and settled the donkeys are. Can’t wait to follow more of your progress in your new home. I hope do Alys will be able to go and see it all in real life! My donkeys wear rugs in the winter. The little devils have a habit of standing out in the most atrocious weather even though they have an enclosed shelter to go in! For sizing, just measure from the center of their chest around to the center of their tail. I think mine are about 54 inches. 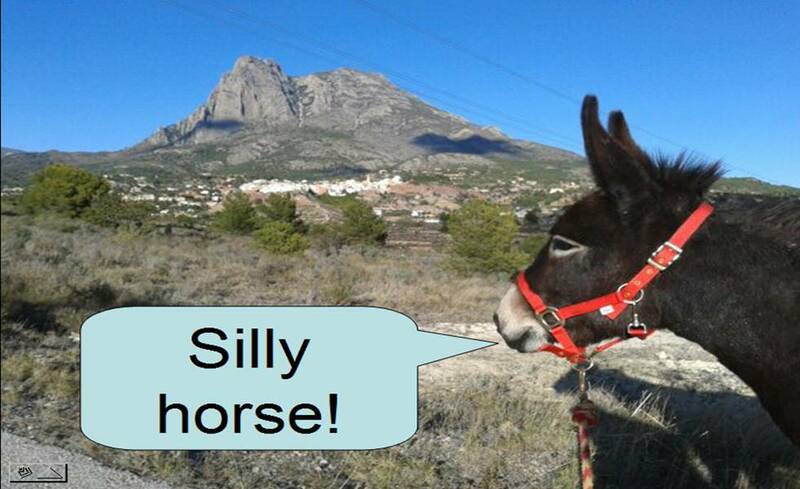 I don’t know about coats for donkeys! Even though it will be colder where we are now, but only comparatively. We are still in a Mediterranean climate and there is only frost high up in the mountains. I’m looking forward to seeing snow on the Aitana ridge above us in the winter. My main concern is that the soil is very soft on the donkey field and we may have problems when it rains: but we have not had proper rain yet, so I do not know what will happen! I hope to get the stable finished soon and then they can stay on the concreted area if the field gets boggy for a short time. Thanks Grace and Luisa. Communications not brilliant at the moment (the location is too remote for Orange signal) but I catch up with comments when I can on the wi-fi in the bar in Orxeta.